FREDERICK, MD-The Frederick Keys are excited to announce their schedule for the 2019 Carolina League season. Highlighted by the Carolina League All-Star Classic on Tuesday, June 18, presented by Visit Frederick, the Keys 70-game regular season schedule includes 22 fireworks dates and new start times for weekend games. Frederick's home opener is scheduled for Thursday, April 4 at 7:00 p.m against the Winston-Salem Dash. The first fireworks show of the year follows one night later following the 7:00 p.m game between the two sides, while games on Saturday and Sunday kick off at 1 p.m. 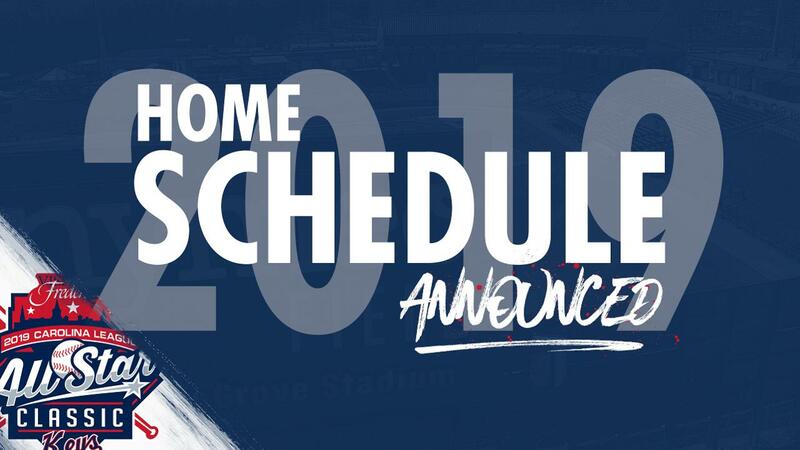 Starting during the 2019 season, Sunday home games and Saturday April games will take place at 1 p.m. This will allow families more time to enjoy weekend activities. The only Sunday exception is Sunday, September 2-the penultimate game of the season and the final fireworks game of the year. Saturday games shift back to 6:00 p.m starting on May 11. Weekday games remain at 7 p.m with the exception of six dates. Frederick plays three 11 a.m games in May (Thursday, May 2, Thursday, May 9 and Thursday, May 23). Additionally, the Keys have noon starts on Monday, July 15, Thursday, July 25 and Monday, September 2 (final game of the regular season). As in previous years, fireworks shows follow Friday and Saturday night home games as well as on Wednesday, July 3 (7 p.m) and Sunday, September 1 (6 p.m). May and August contain six fireworks nights each and five are slated for July. May is the Keys busiest month (19 games) followed by July (15 games) and August (14 games). Frederick's most common opponent at home is Beltway rival Potomac, who visits Nymeo Field 16 times. Games against the Nationals are backloaded on the schedule. After the P-Nats visit for three games from May 7-9, they do not return until July 26. In August and September though, Potomac visits Frederick 10 times. Overall, 41 of the Keys 70 home games come against CL North competition, with Salem (10 games) as the second-most common opponent after Potomac. Fayetteville (nine games) is the most frequent home opponent from the CL South. The game time for the Carolina League All-Star Classic is still to be determined. To be eligible to purchase all-star tickets, fans can buy/renew ticket plans for the 2019 season by calling 301-815-9900. For more information about next year's all-star game as well as more details about the 2019 regular season fans can visit frederickkeys.com. April 4 v WS-7 p.m.
April 5 v WS- 7 p.m.